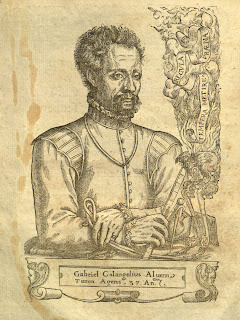 Due to the generosity of Samuel Nass, Brandeis Special Collections has in its holdings three interesting volumes of Renaissance cryptography: the Cryptographia of Johannes Balthazar Friderici, a French translation of the work of Johannes Trithemius, and the important ninth book of the Systema Integrum Cryptographiae of Gustavus Selenus. All three are rare and important examples of a craft that became quite popular in the Renaissance, and one of the volumes has the added distinction of being cited as a central piece of evidence in the Bacon-Shakespeare controversy over the authorship of Shakespeare’s plays. Friderici’s classic treatise on cryptography was first published in 1684; it contains a survey of the field, including information on ciphers in letters, gestures, signs, and music, as well as instructions for the preparation and use of invisible ink. (It is perhaps only a coincidence, however, that a book with such instructions is housed in Special Collections quite near a seventeenth- or early eighteenth-century volume whose pages are all curiously blank.) 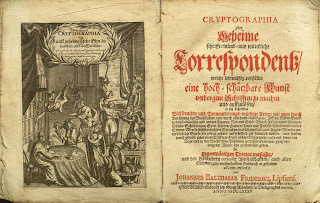 Brandeis’s copy of the Cryptographia is from the 1685 edition, the second of four editions of the text. It is bound in original decorated red paper boards with a modern brown cloth spine and gilt title. The text is in German, printed entirely in black letter, with the title page done in red and black. 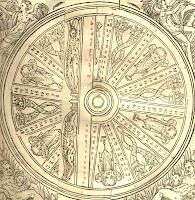 The book includes a fine engraved added title page and several additional plates by Friedlein, as well as numerous letter-set and woodcut illustrations within the text, showing the various cryptographic systems. The volume is complete except that it lacks, apparently, one folded plate, likely originally present between pages 198 and 199. The second volume is the Polygraphie, et Universelle Es criture Cabalistique de M.I. 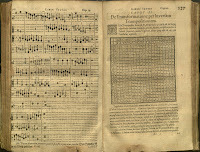 Tritheme Abbé, a French translation with commentary by Gabriel de Collange of the work of the Würzburg abbot Trithemius, whose Polygraphia was placed on the Index of Prohibited Books by the Catholic Church in 1609. It is bound together, with continuous pagination, with Collange’s own Tables et Figures Planispheriques. Trithemius was rumored to be a magician, and his three volume Steganographia, which appears to be concerned with black magic, did nothing to repair this reputation. However, a decryption key to the first two volumes was published in 1606 and showed them to be actually concerned with steganography, that is, the study of hidden messag es, as the title claimed. The binding is of later unadorned vellum with red speckled edges and replaced endpapers, and the text is in black and red and features fine woodblock head- and tail-pieces and initials throughout. It opens with an engr aved title page with a full border that includes, in the upper margin, the royal arms of France, while the following page contains a full-page engraving of the translator of the Polygraphie and the author of the second work, Gabriel de Collange. 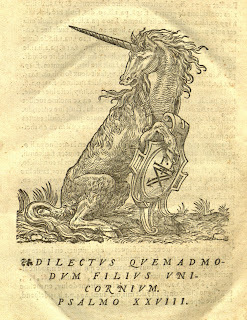 The colophon is also especially worthy of note, as it includes a large engraving of a unicorn clutching an escutcheon, under which is the enigmatic Biblical motto Dilectus quemadmodum filius unicornium. Psalmo XXVIII. [“Just as the beloved son of unicorns. 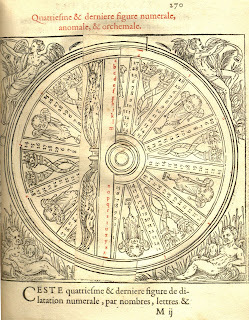 Psalm 28 (Verse 6).”] Most interesting, however, is a series of large instrumenta p resent within the body of the text (from f. 252 r. to f. 273 r.), each consisting of a moveable wheel which turns to create various alignments of letters or symbols for creating coded messages. The scanned pictures of the instrumenta and several of the engravings may be enlarged by clicking on the images. 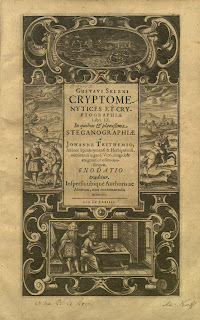 The third volume donated by Nass, and perhaps the most famous due to its importance to several prominent adherents to the “Bacon theory” of the authorship of Shakespeare’s plays, is the Cryptomenytices et Cryptographiae, Book IX of Gustavus Selenus’s work on cryptography. Gustavus Selenus, which roughly translates to “man of the moon,” is the pseudonym of the book collector August, Duke of Braunschweig-Lüneburg (1579-1666), the founder of a famous library that bears his name in Wolfenbüttel. The original aim of Duke August in writing this tome was to elucidate the writings of Trithemius, including those found in the Polygraphia. However, this soon morphed into an effort to create an encyclopedic account of the science of cr yptography as it was then practiced, which was the first attempt to provide a comprehensive account of this field. This book—and, indeed, the entire library compiled by Duke August—is also of interest for its influence on the philosopher Leibniz, who served as librarian of the collection just a few years after the death of the duke (1676-1687). The volume is a folio (30 x 19 cm.) bound in full contemporary blind-stamped vellum with a manuscript title on the spine. The covers also show the remnants of four later green cloth straps, only one of which is now intact. The text includes an engraved title page and one additional full-page engraving on p. 341, as part of a chapter on using coded art to communicate messages, and there are numerous additional tables, diagrams, and illustrations throughout. The printing is especially fine, with numerous engraved head-pieces, tail-pieces, and initials. The work ends with a codex including a large crest with the charming motto per aspera ad astra – “through harsh lands, to the stars.” This copy is in relatively good condition, though the paper on which the volume is printed has browned somewhat, a common affliction of this text due to the poor quality of paper employed in German-speaking countries during the Thirty Years War. It has been called the first encyclopedia of cryptography, as described above, and it certainly aims for a full description of the science, with chapters on everything from simple inverted and transposed alphabet codes to accounts of cryptography in music and the visual arts. 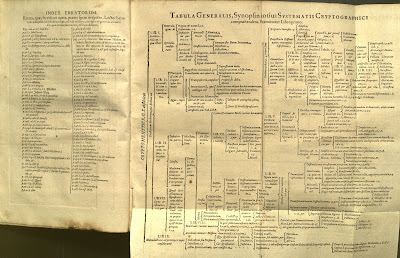 A large schema detailing the relationship of various parts of the field to one another is included on a folding plate just before the first chapter of the book (pictured below). The great (i.e. First) Folio of Shakespeare was published in 1623, and in the following year, 1624, there was brought out a great cryptographic book by the ‘Man of the Moon.’ This book was issued as the key to the Shakespeare Folio of 1623, under Bacon’s instructions, and in the year following the publication of the Great Folio. Examine first the left-hand picture, you see a man, evidently Bacon, giving his writing to a Spearman who is dressed in actor’s boots. Note that the Spearman has a sprig of bay in the hat which he holds in his hand. This man is a Shake-Spear, nay he really is a correct portrait of the Stratford house-holder, which you will readily perceive if you turn to Dugdale’s engraving of the Shakespeare bust. In the middle distance the man still holding a spear, still being a Shake-Spear, walks with a staff, he is therefore Wagstaffe. On his back are books – the books of the plays. In the sky is seen an arrow, no, it is not sufficiently long for an arrow, it is a Shotbolt (Shakespeare, Wagstaffe, Shatbolt, of Camden’s ‘Remains’). At the bottom of the page in the centre Bacon is sitting at his writing desk composing his dramas; at his side the actor from Stratford with a mask and in Bacon’s clothes being led by strings as Bacon’s puppet. Both are ‘covered by one cap’ which signifies that they have a secret agreement. Readers may make up their own minds as to the viability of this theory by comparing Lawrence’s explanations to the images pictured on the title page of this volume. 4to. (20 cm). ff., 280 pp., 5 (of 6) plates; lacking the folded plate. 4to. (24 cm). ff., 300,  pp., 13 instrumenta. 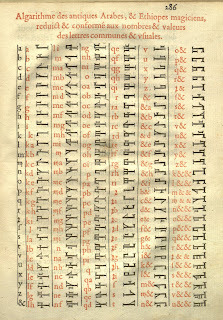 Folio (30 cm). ff., 493,  pp., 5 folded plates. Cryptomenytices et Cryptographiae is available online in .pdf format from the Bancroft Library of the University of California at Berkeley, www.billheidrick.com/Orpd/Trith/index.htm. Polygraphie, et Universelle Escriture Cabalistique de M.I. Tritheme Abbé is displayed as part of the online exhibit “The Fantastic in Art and Fiction,” from the Division of Rare and Manuscript Collections of the Cornell University Library. Scheid, Nikolaus. "John Trithemius." The Catholic Encyclopedia. Vol. 15. New York: Robert Appleton Company, 1912. 2 Jun. 2008 www.newadvent.org/cathen/15062a.htm.